A reliable and cost saving catenary determines to a large ex­tent the efficiency of electric power supply for train haulage and for railway operation at large. Apart from conventional requirements to be met by catena­ries such as high reliability at all weather conditions and economic efficiency a number of new features should be co­vered. The main of them are the following: to be maintainable with the minimum manual work involved while ensuring trou­ble-free train traffic, substantial saving of time required to remove possible damages, raising the efficiency of the operation of electrified lines; ensuring reliable operation of high speed traffic on electrified lines, facilitating the maintenance of tracks and fixed installations in particular on sections being considerably lifted during renewal operations; raising the safety standard of catenary maintenance practice under condition of high traffic density by reducing the volume of work involved in running maintenance and in removing possi­ble damages due to limiting the affected zones. A review of known types of compensated catenaries shows they incorporate the following disadvantages: lack of unifor­mity of tension within the limits of anchoring sections, substantial changes in the parameters in case the catenary is exposed to additional loads caused by the wind and icing; complexity of the compensating devices which require cons­tant monitoring; insufficient rigidity of the suspension resulting into sagging of the wire at high speed traffic which initiates damaging of the pull-off and current collecting devices (especially when several current collectors are in operation simultaneously); substantial work required to ad­just the suspension arrangement and to maintain the pre-set parameters during train traffic; an extremely long zone of damage in case a rupture of the wire of the catenary occurs. The big variety of catenary designs, deficiencies of some catenary designs, and their complexity call for a continuous search for optimum alternatives with- increased reliability, with improved cost/benefit characteristics and increased labour productivity of the maintenance personnel. In order to meet more fully the requirements of a catenary designed to be used in severe operational conditions a new type of catenary has been developed that should meet the following requirements. The catenary must have a limited vertical clearance, it should be of a simple design using stan­dard components and parts only with no requirements for ad­justment during operation. Moreover, the catenary must in­sure a high level of operational reliability, it should incor­porate perfect dynamic properties and, what is most impor­tant, the zone of damage in case of a rupture of wires of the catenary should be many times smaller than that with the chain type catenary. The main specific design feature of this type of the catenary is a new arrangement of the location of the contact wire and the messenger wire. This type of catenary may be called Automatically Compensated Spatial Catenary (ACSC). There are several modifications. The basic design of an ACSC is shown in Fig. 1. The catenary consists of two messenger wires and of two contact wires. The messenger wires are located along both sides of the track axis and they are rigidly fixed through in­sulators to supporting points. The contact wires which form a rhombic figure in a horizontal plane are located symmetrically in relation to the track axis. This is ensured through linking them with a hinged strip-out at the anchor span whereas in the middle of the span between two neighboring strips each contact wire is linked to the cor­responding messenger wire through fixing components. The fixing components have a dual function: they serve as sup­porting points for the contact wire and at the same time they are used to fix the contact wires in relation to the axis of the track. The length of a section of the ACSC is depending on the operational conditions. On mainlines the length of a section corresponds to the standard length of presently existing sec­tions whereas on bridges and in tunnels they are reduced to correspond to the clearance of those structures. Theoretical and experimental investigations resulted into developing a specific feature of the ACSC catenary and that is the self-compensating feature. With the messenger wire and the contact wire being fixed rigidly onto the anchors the catenary seems to be non-compensated in terms of its form and implementation but in terms of its operational features it is indeed compensated. At a loaded status the contact wires generate load which is transferred to the messenger wires causing thereby a cer­tain deformation of the latter. This load consists of two forces - a vertical force stemming from the gravitation force of the contact wire and a horizontal force stemming from the force generated by the zigzag of the contact wires. The system of messenger wires and contact wires becomes prestressed. As the temperature goes up the sagging of the messenger wires increases in the vertical plane while the wire goes down. The conlact wires are expanding under the temperatu­re impact as well as their tensioning declines. Due to this the angle of sagging of the contact wires changes at the fixing points and the horizontal forces affecting the messenger wires change correspondingly. Consequently the load upon the messenger wire increases as a function of reactional forces caused by the changes of the angle of fracture of the contact wires. Similar processes take place in the messenger wires but the forces resulting thereof remain balanced. The precise cor­responding of the changing forces to the temperature ef­fected expansion of the components of the system depends on the type of material used and on the specific design features of the catenary which are determined through calculations. No horizontal displacement of the wires of spatial type catenaries has been observed with regard to the longitudinal plane of the track even with a semi-compensated alternative of this type of catenary. Temperature effected displace­ments normally take place in the transversal direction in rela­tion to the axis of the track. The ability of spatial type catenaries of self-compensation makes it possible to remove all restrictions as regards the length of the anchor section which, in this case, primarily is determined by the power supply and sectionalizing arrange­ment. The expanding of the anchor sections on mainlines makes it also possible to do away with such a complex problem like their interfacing. Also there is no need any more for a fre­quent adjusting and the reliability of the catenary as a whole has been improved since most of the damages of curren! collectors take place at the points of power supply section in­terfacing. Increasing the length of the anchor sections in a combination with the selfcompensating feature of the spatial catenary when installing it in tunnels makes it possible to reduce con­struction work considerably. This is attained because cells for the housing of compensators can be dispensed with since any distance of the tunnel can be spanned with a single anchor section. The spatial rhombic type of catenary is void of supporting wires as well as other fixing components which are part of the conventional type of catenary of mainlines. Due to this maintenance operations become much more simpler. There is no need for any periodic adjustment whatsoever. The posi­tion of the contact wire is adjusted in the longitudinal and transverse planes during its installation only. Running maintenance of such a catenary system can be ar­ranged applying the so called "module" exchange method. In order to apply this method only suspension components are required, that is sets of insulators and com­ponents used to fix the contact wire to the messenger wire. The replacing of any of these components does not re­quire much time. One more essential feature should be pointed out: the suspension system consists of stan­dard parts and components only. There is not a single component which had not undergone intensive testing under operational environment. Yet the list of components of this catenary is smaller than that of a conventional catenary. All this contributes to an improved reliabili­ty of the spatial rhombic type of catenary. In case of damages the zone affected is limited which is another most impor­tant operational feature. For instance, in case of disruption of one of the con­tact wires of the spatial rhombic type of catenary the tension is redistributed through articulated strips between the second contact wire and the messenger wires. The zone affected by the damage is limited to one link only. The length of the zone remains the same even if both contact wires are disrupted and this is due to the rigid fix­ing of the messenger wires at the suspension points. Thus, the length of the zone affected by a damage of the contact wires of the spatial-rhombic catenary is 15 to 20 times shorter (depending on the length of a link) com­pared to the vertically suspended type of catenary. When carrying out repair operations in­volving the joining of the contact wires no adjustment of the suspension system is required at all. The contact wires are themselves taking their original position both in the longitudinal and transversal planes. As there are neither dropping wires nor components to fix them with the new catenary which would require constant monitoring and maintenance, the scope of maintenance work is substan­tially reduced. Moreover, the complex work involved in the installation and ad­justment of the spatial rhombic type of catenary does not exceed that required with the conventional type of catenary. One of the most important features of any catenary designs is the change in the tension of its wires caused by atmospheric impacts, that is by the impact of the temperature and by the load caused by changing the length of the wires, their positioning and tensioning. When making mechanical calculations of the catenary, based on the knowledge of the clearance and the tensioning corresponding to certain temperature and load, parameters are identified which correspond to other environmental conditions as well. The dependence of the parameters of the wire upon the changes in the loads is determined, as it is known, by an equation of the condition. When making calculations of the spatial catenary this tasks turns out to be far more complex compared to conventional catenaries. The reason for this lies in the necessity to take into consideration the changes in the wires in three dimensions which is needed for positioning of wires. Apart from distributed vertical loads the catenary is exposed to concentrated vertical and horizontal loads. They can not be replaced by distributed loads as it is done when making calculations for vertically suspended catenaries where simplified methods are applied. With the spatial rhombic type of catenary the concentrated forces having an impact on the messenger wires are applied at the points to which the contact wires are fixed. These points are located within one link at distances of 15 to 17 meters and they are strictly defined. Fig. 2 and 3 show the installation diagrams for short links used in tunnels as well as on open sections. Fig. 2 represents" the interdance of the tensioning of non-loaded wire Tpx on the temperature t, while on Fig. 3 the installation diagram is shown of both a non-loaded wire which is being installed (curve Tpx) and a loaded messenger wire (curve Tx). Comparing the curves in Fig. 2 and Fig. 3 one can see that as the length of the link is increased the range of change of the tensioning of the messenger wires of the spatial rhombic catenary gets smaller and this means, that the changes of vertical clearances caused by temperature changes are less. The installation diagrams of the catenary for tunnels (as it is shown in Fig.2) are in­dicating the range of changes caused by ambient temperature changing within a span of 80°C, that is to say that it is the same as for open air sections. As a matter of fact, practical experience proves that in tunnels the temperature deviates from the average value within a range of 5 to 10°C only. Thus, the catenary will ensure reliable operation under minor changes in the ten-sioning of the messenger wire. This feature ensures the stabilizing of the clearances in the course of operation. One of the most important requirements of high speed lines is a proper rigidity of the catenary. And not only the magnitude of instability is important but the nature of changes occurring all over the length of the section is taken into account. The rigidity determines the static properties of catenaries and it is a function of the force, applied to the contact wires, and the caused protrusion of the wires. The theoretical in­vestigations into the rigidity of a link of a spatial rhombic type of catenary are rather complex and an individual approach is required when a specific design is to be evaluated. 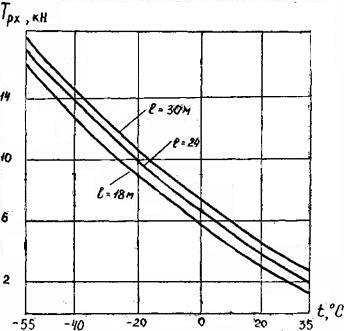 The com­plexity of the problem lies in the fact that the rigidity feature is primarily determined by the design of the catenary with regard to the suspension component and to the behaviour of the middle part of the link, by the metrical parameters etc. The method of making calculations for the rigidity of the spatial rhombic type of catenary has been improved com­pared to that used to make calculations of the conventional catenary. One had to take into account the impact of forces in three dimensions. The calculated values obtained are of a universal nature. They take into account the impact neighbouring links have upon the one under consideration as well as the effect other parameters of the catenary have, such as the type of wire used, its tensioning etc. The size of the links of the contact system and the distance between the points of placing fixing components may be different depending on the various designs of the catenary. This makes it possible to choose the parameters for each individual design of the catenary so as to meet best the optimum conditions of the interacting of the current collector with the spatial catenary. The quality of current collection is the better the less the deviation of the contact pressure from the pre-set optimum value covering the whole of the link. The best condition for high quality current collection is when the rigidity is the same at any point of the link. 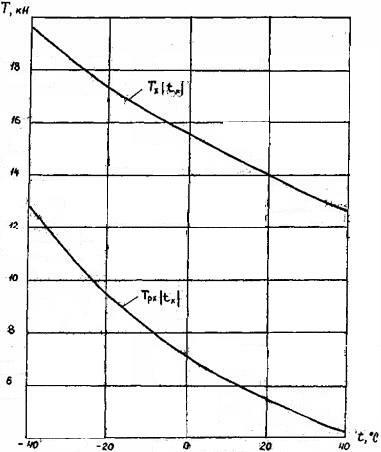 In order to determine the impact the various parameters of the suspension components have upon the distribution of the rigidity over the entire link, the no­tion of coefficient of rigidity is used which is the relation of maximum "rigidity to its lowest value. The closer the coeffi­cient value comes to the figure one the better are the condi­tions for current collecting. When the rigidity coefficient is close to the figure one then the catenary is a uniformly elastic system. 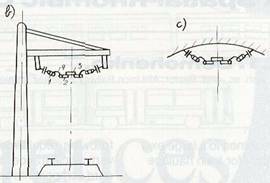 In this case the conditions of the interaction between the pantograph and the catenary is considered to be optimal. The rigidity value and the nature of its distribution over the link can be controlled through the change in the design of the spatial catenary. The displacement of the fixing components in relation to one another on the link results in distorting the regular rhombs formed by the contact wires. Mention should be made that the points at which the contact wire is secured to the messenger wire and at which the suspension system is most rigid, are shifting with regard to corresponding points of the second half of the link while the overall rigidity wilhin the link does hardly change at all. The value of the coefficient can be reduced by 20% on links in case when the distance between components are equal to one third of the distance between the articulated joints connecting the contact wires within the link. For 70 meter links of mainlines the calculated coefficient lies within 1,40 and 1,19 for any tensioning value of the messenger wire. The testing of the spatial rhombic catenary has proved that the rigidity of the suspension within 55 to 70 meters at temperatures ranging from 15 to 20°C remains practically constant at all points, that is, the coefficient of non-uniformity of the distribution of the rigidity of the suspen­sion over one link equals 1 (the elasticity of the suspension is uniform). Based on this the conclusion can be made that the spatial rhombic catenary can be used on high speed lines. On open line sections of a conventional catenary for links of a stan­dard length due to the necessity to extend the supporting rods of messenger wires the horizontal dimensions of the ca­tenary. This makes it necessary to install the catenary on horizontal consoles which must be up to 5 meters long. In order to reduce the horizontal dimensions of the spatial catenary, rigid stretching plates can be placed at the middle of the link between the messenger wires. This makes it possi­ble to reduce substantially the horizontal dimensions while the vertical clearances of the catenary remain unchanged. The stretching plates are of a pipe type profile to avoid a building up of concentrated weights that would have a negative effect on the dynamic behaviour of the catenary with links of a considerable length. Two and even three such stretching plates can be installed. This makes it possible to install the catenary with such horizontal dimensions which are normally used to cover 50 or 30 meter long links. The spatial rhombic type of catenary is of a fundamentally new design. The nature and the scope of possible damages that may occur with it is presently being studied. Special destructive tests have been undertaken to identify the nature of possible damages, the scope of the damage affected zone and the time required to remove the damages. In case of disruption of one of the contact wires, like ex­pected, the zone affected by the damage was limited to one link only. The neighbouring links on both sides showed minor changes in the positioning of the contact wires. In case of disruption of one of the messenger wires the zone affected by the damage was limited to one link only as well. In the neighbouring links the positioning of the wires of the catenary practically did not change at all. In the course of operation of the spatial catenary disruptions of messenger wires occurred. They happened at those places which had been damaged during installation opera­tions. The disrupted messenger wire was not within the outer dimensions of the motive power and the catenary remained operational. Train traffic as a matter of fact was not inter­rupted on this section while the damage was removed. Sections of lines on which the spatial catenary is in operation for a long time on the Moscow and on the October railway regions show high reliability under heavy traffic environment. Inspections and measurings undertaken show that the status of the contact wires show no iocal wear, nor any mechanical defects or burns. Over a number of years of operation no adjustments were needed whatsoever. An 6 km long anchor section of the spatial catenary proved to be most reliable. (The section can be seen in Fig. 4). At the moment arrangements are being made to install an anchor section which will be 10 km long. Major problems are involved in ensuring a trouble - free cur­rent collection with conventional catenaries when trains are run with several pantographs simultaneously in operation. In this case vertical oscillation of the catenary initiated by the first pantographs affects negatively the interaction with the catenary of the pantographs that follow. Constant monitoring of the interaction between the pan­tograph and the catenary of the spatial rhombic type has shown that the fading of the oscillation takes place much faster than with the conventional type of catenary. The amplitude of oscillation is considerably smaller. While operating multiple electric trains with 5 pantographs in a rais­ed position at a time no wire disruptions or sparkling were registered. The spatial rhombic type of catenary is much more wind resistant than the conventional catenary and it is not subject to automatic oscillation. Presently the work on designs is nearing completion for Ihe electrification of a line exposed to such heavy winds which make it impossible to use the con­ventional type of catenary even with a reduced length of the links. On the same line a modified spatial catenary design will be used to span a double track tunnel that had been built long ago having limited vertical and horizontal clearances. This new tape of catenary is in operation for a long time already covering one of the longest tunnels in the USSR that is a 8 km tunnel. The catenary in this tunnel consists of a single anchor section. Each link of the section is 26 meters long. In this case the vertical clearance is 400 mm. If the link is reduced to 17 meters then the clearance may be as small as 200 mm. Test runs with two electric locomotives coupled together with four pantographs in a raised position have shown that the pressure stroke of the contact wires does not exceed 50 to 60 mm. Trains are run on this section using two twin-unit electric locomotives. Yet in the course of operation there were no damages of Ihe catenary observed. In the future the spatial rhombic type of catenary will be used in tunnels in this country. A project has been worked out to electrify the 15 km Severo-Muyisk tunnel on the Baikal-Amur mainline using the spatial catenary. The tunnel will be covered with a single anchor section without providing cells for Ihe accommodation of anchors. Several modifications of the spatial rhombic type of catenary have been developed so as to be suitable for the installation in curves, on double track lines as well as to meet other operational requirements. For instance, placing the insula­tion in the fixing components of the suspension system makes it possible to use the messenger wires as grounding wires, or wave guides or as separate power lines. The utilization of the spatial rhombic type of catenary on main­lines increases the reliability and the technical standard of the power supply in one of its most important components.